It’s the day after Sunday (we won’t say the word), and we’re enveloped in the evil fog. So summer has officially arrived. And with summer comes thoughts of The Beach Boys. Which reminds us: the reunited Beach Boys are coming to the Santa Barbara Bowl on May 28th (Memorial/Anniversary Day), and will include Brian Wilson, Mike Love, Al Jardine, Bruce Johnston, David Marks and a host of backers. What better way to spend Memorial Day? 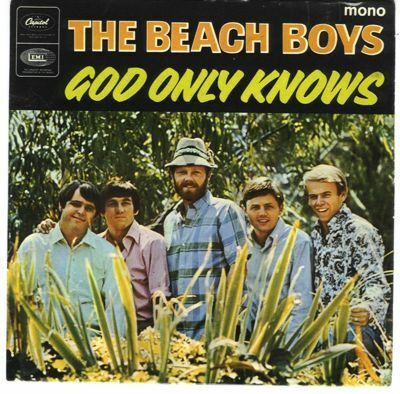 Before we get ’round to listening to the real deal (last year’s Smile Box Set is highly recommended), in time of need we keep returning to two covers of the Boys’ God Only Knows. The first (featuring Canada’s talented Joe Grass on pedal steel) matches the morning’s mood. The second is by the phenomenal (and phenomenally horribly named) Dale Earnhardt Jr. Jr. and never fails to lift. We’ve written about the preternaturally-talented DEJJ before and love their Grizzly-Bear-As-Applied-to-Beach-Boys-and-Vocals-Beyond effect on this cover in particular. We’ve been calibrating and cogitating on Jack White’s new solo album, Blunderbuss. So far we’re calling it the most dynamic and varied album of his career. No one can doubt White’s prowess as a fiery guitar player. And on the new album there are early tracks with moments that, as good as they are, smack of the same-old (though even those moments have comparatively enhanced elements). But as the album progresses we were pleasantly surprised by White’s piano-playing taking centerstage and far more variety and dynamism on the album than historically. In support of the new album, Vevo/YouTube is streaming White performing at New York’s Webster Hall. The stream is part of the “American Express Unstaged” series, and it’s directed by actor Gary Oldman. Check it out HERE. Oklahoma’s more-than-OK Other Lives thoroughly impressed during their opening set for Radiohead on the band’s recent tour leg and particularly at the Santa Barbara County Bowl. As we said in our review of Radiohead’s Bowl show, the Other Lives seem to have come under the particular influence of Radiohead (and who can blame them) and enlarged and morphed their sound to match more closely their touring colleagues. For a flavor, watch below and listen to Other Lives’ performances (in LA following Coachella) for “The Switch” presented by La Blogotheque and YouTube. You can hear the Radiofied sound in particular on the first performance (of For 12). 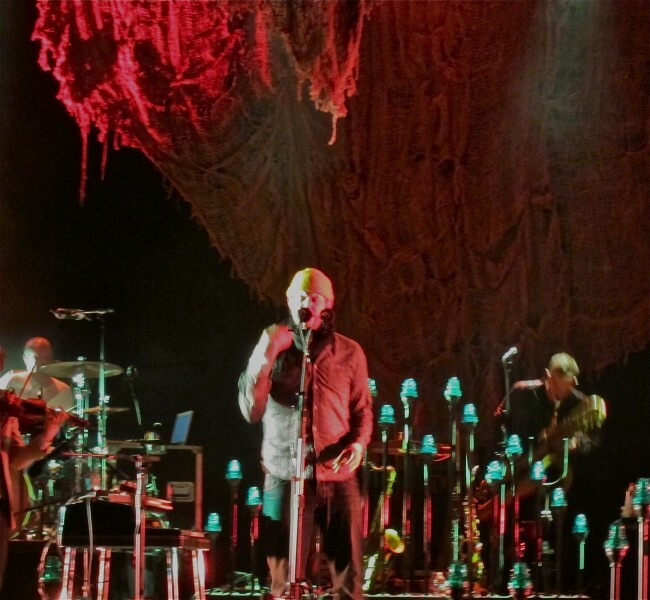 Also included are performances of Desert (with Jesse Tabish‘s vocals sounding more Yorke-ish than ever), Tamer Animals (with its Interpol accents), Old Statues and Dust Bowl, all off of last year’s critically-acclaimed Tamer Animals album. 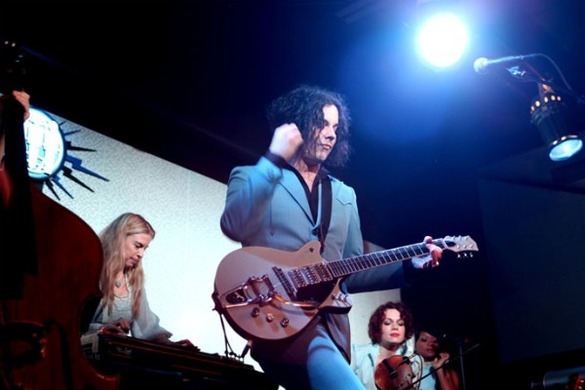 Jack White showed up on The Colbert Report last night. Check out his performance of Freedom at 21 from his new album, Blunderbuss, and the usual Colbert interview shenanigans below. Check out below recent musical performances on late night TV. As we’ve said before, one of the comparatively unsung (if you will) heroes of Bon Iver is S. Carey, the artist formerly known as Sean Carey. Following on the heels of his brilliant, underrated 2010 album All We Grow, and amidst his obligations with Bon Iver, Carey will on May 8th release Hoyas, a four-track EP on Jagjaguwar. In advance of Hoyas’ release, check out one of the tracks below from the EP, Two Angles. And though we’ve posted it previously, in case you missed it we can’t help but repeat the recent brilliant piano-duet performance by Carey and Justin Vernon as recorded by 4AD. Having already paid homage to Bruce Hornsby via Beth/Rest, check out Carey and Vernon seemingly giving George Winston his due (with a scrap of Scriabin thrown in for good measure) from 15:52 on. More magnificence. And finally, for a better flavor of S. Carey’s 2010 album All We Grow, check out at bottom the official video and a live performance of that album’s song In the Dirt. And then go HERE to pre-order Hoyas. 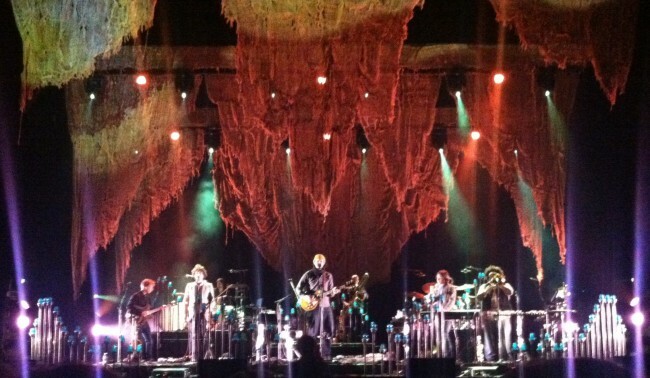 Bon Iver brought their supremely musical magic to the Santa Barbara Bowl on Sunday. 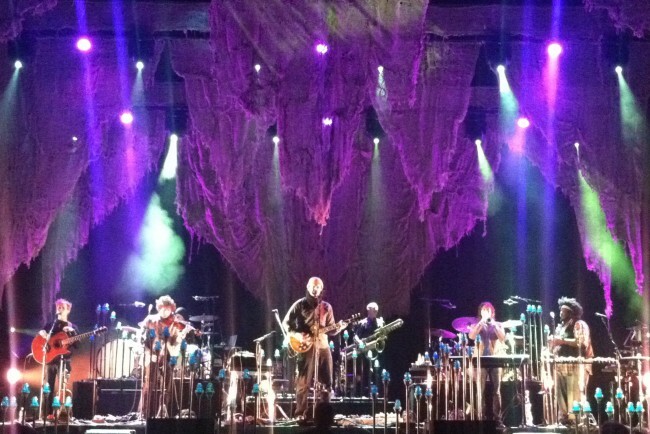 What a long, strange trip it’s been for Justin Vernon and crew. 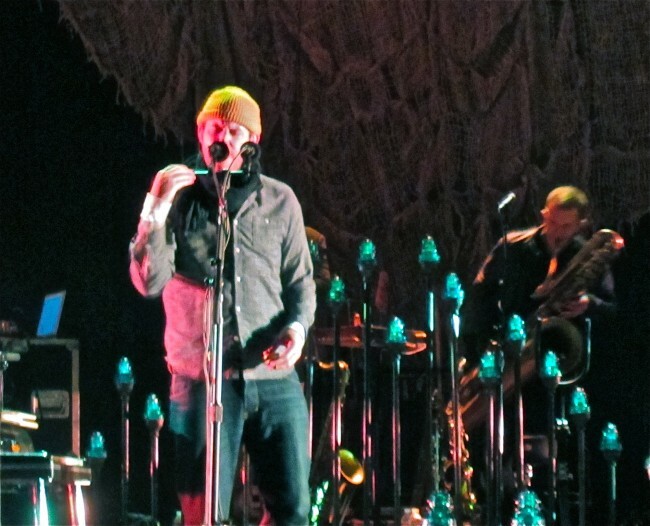 The last time we “saw” Bon Iver in Santa Barbara was in March 2008 from the sidewalk (sold out, failed) outside Muddy Waters with the fantastic Phosphorescent opening (keep your eyes and ears open at all times folks). 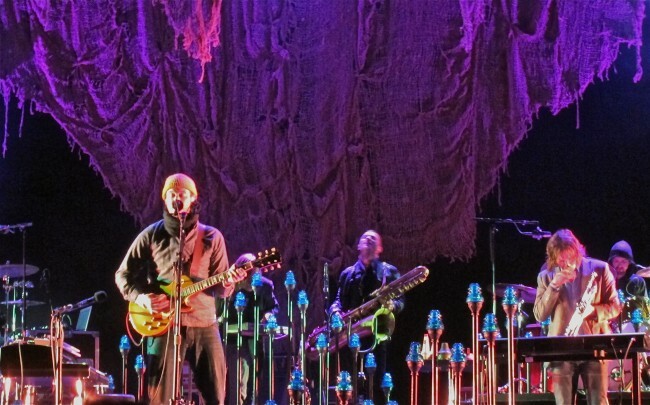 Even then, with their soulful songwriting and live delivery, you could tell Bon Iver would likely go big. And now with its bigger sounding second album and its nine touring members, not only has the band gone big and swollen in number, they are also putting up big numbers across the musical spectrum (No. 1 ranked album of 2011 by many critics, No. 1 ranked concert of 2011, huge selling tour, Grammy Award, etc.). And they had absolutely no problem selling out the Santa Barbara Bowl. 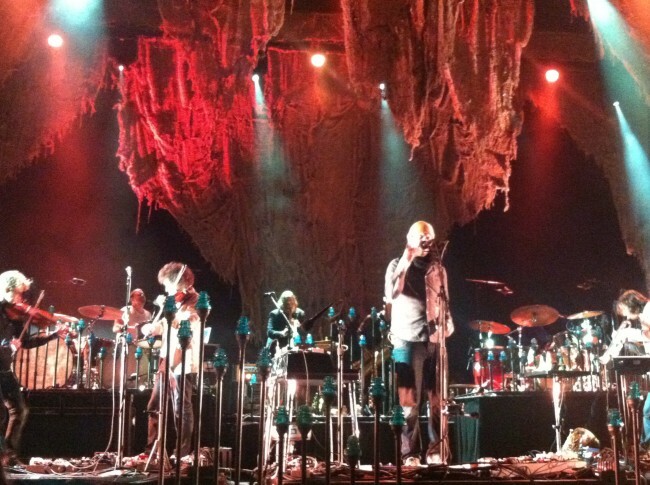 On this foggy night, Bon Iver warmed the crowd with as powerful and moving a show as we have seen in quite some time. Sure, Radiohead can’t be touched for sheer inventiveness and performance brilliance, but Bon Iver’s sound and Justin Vernon’s way with words captivate like few can. And if you’re not careful during their shows, a particular line or two (with perfect accent from accompanying trombone, clarinet, sax or guitar) might resonate deep within. You might even find yourself fighting (or not) off eye-secretions. The pin-drop crowd at the Bowl sat in reverential attention the entire main set until being involuntarily lifted up to their feet at set’s end to applaud and rave through the encore. Following an enjoyable opening set by Bon Iver’s Wisconsin pals, All Tiny Creatures (with similar melodic resonances as Bon Iver, but leaning a little harder on their electronic influences and adding some dirge-jam elements), all nine Bon Iverians sauntered onto the stage, including Justin Vernon and regular Bon Iver members Sean Carey (he of the scarey-great 2010 solo album and new EP on violin, guitar, keys and drums), Mike Noyce (guitar) and Matt McCaughan (drums), with the addition of Rob Moose (violin and guitar), Mike Lewis (bass), and a horn section that included the Canadian horn colossus Colin Stetson (who has played with seemingly everyone including Tom Waits and Arcade Fire), Reginald Pace, and Carmine Camerieri. As the band wondered onto the stage we couldn’t help comparing the lighting to last week’s Radiohead show. 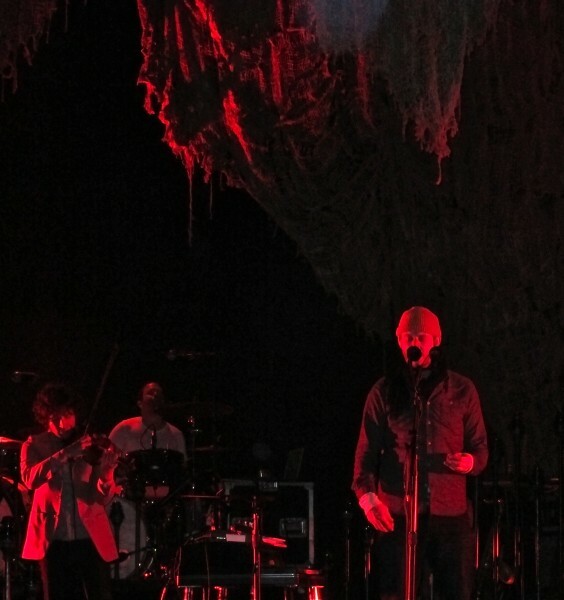 While the stage lighting and sound were comparatively subdued for Bon Iver, it meshed perfectly with the band and their delivery. Their entrancing ensemble playing would ultimately carry the night. Throughout their 90-minute set Bon Iver thoroughly enamored the Bowl crowd with songs from their entire discography, including newer material from last year’s bountiful “Bon Iver” album, as well as favorites from 2008’s For Emma, Forever Ago, all of which meshed well with the more obscure Beach Baby from the Blood Bank EP and a cover of Bjork’s Who Is It (see setlists at bottom). The songs from For Emma have been enlarged and enhanced by the big band and new arrangements. The sequencing and transitions between songs were perfect, with (thankfully) minimal stage banter. Vernon spoke best through the music while vacillating between electric (Thoreau can play, people!) and acoustic guitars, and keyboard/effects to great affect. But we were most surprised by the strength and versatility of Vernon’s falsetto vocals. At times he even invoked the ghost of Marvin Gaye. Yes, he’s that good live. In addition to Vernon, Colin Stetson nimbly strutted on bass, baritone, and alto sax, and even tossed in some clarinet for good measure. Sean Carey was MMVP (Most Musically Valuable Player), adding instrumental accents (his violin-see the penultimate photo below-and guitar playing were particularly adept) to go with stirring harmony vocals. The rest of the band filled in and enhanced sublimely (the dual-drumming, Mike Noyce’s guitar and sonorous harmonies, and Reginald Pace’s trombone segments and intricate percussionisms were especially appreciated). It all added up to estimable ensemble playing. After settling in on stage, the band kicked into the memorable opening riff of Perth before moving into the TV-on-the-Radio-meets-banjo sounds of Minnesota, WI. Up next was one of the best songs written in this millennium, Holocene. We’d be lying if we told you it did not move. Contrary to the lyric, the band and song were truly magnificent. After came the towering jangle of Towers followed by the obscure but heart-rending Beach Baby (with original pedal steel beautifully supplanted by dueling-violins). Hinnom, Tx was followed by the clock-tower tones of Wash. The band then turned Creature Fear into the “rocking segment” of the evening (check the video below from 3:37 on and particularly at 5:57 when the light show kicked up). The beloved Blood Bank followed, with Colin Stetson’s primal intro and Vernon’s soulfully sung words following. Next up was re: Stacks and as with the others, the band held the crowd in its palm. One of our and the crowd’s favorites, Flume, followed and flaunted its harmonious wares (the combo of horns and harmonies were heavenly). 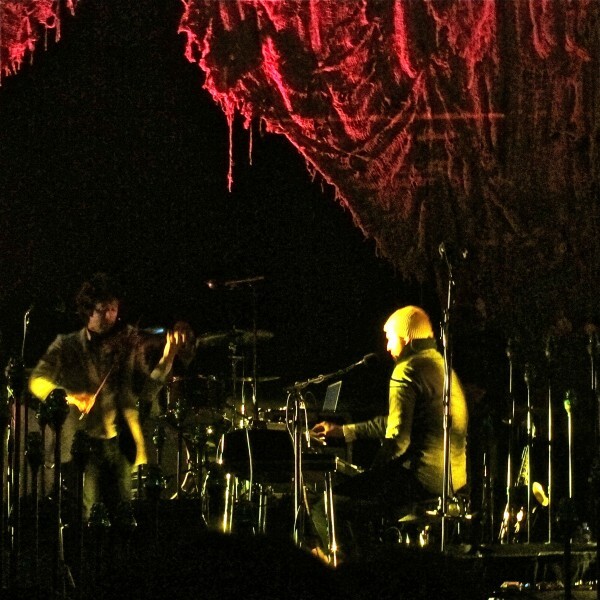 What followed was easily the highlight of the evening: Skinny Love. 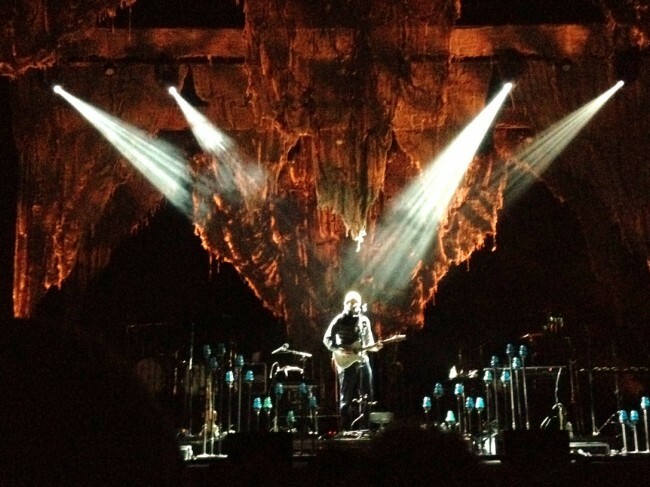 Bon Iver long ago (well, four years ago anyway) built from this song foundation, and it is solid rock. Just check out the first Skinny Love video below (thanks D!) 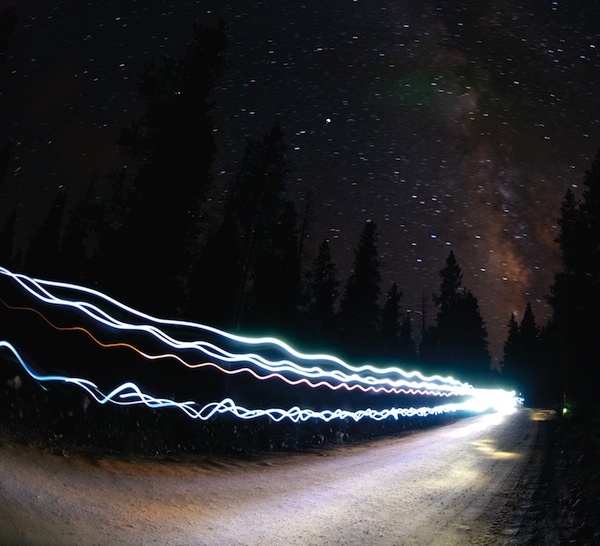 at 2:20 when the world thankfully disappears (for a bit at least). The band then closed out their main set with a Calgary-Lisbon,OH-Beth/Rest medley. Calgary was suitably cherished by the crowd, and the medley’s transitions were sagely subtle. We have our usual complaint about Beth/Rest: must we endure the vocoder, Justin? Less vocoder!! Despite Vernon’s deliberate affectations and voc(oder)ation, the song’s melodies and delivery eventually overcame the effects. After a hectoring demand, the band came back out and surprisingly gave us Bjork’s (Paul Simon-ish) Who Is It (really, not Michicant or Wolves as indicated in your setlist below? ), but then redeemed completely where it all began: For Emma. We don’t know you Emma (assuming you exist), but you have to be extremely proud to have set this musical juggernaut in play. Like we said, not a dry eye in the joint. To repeat: they were magnificent. Check out more photos below, followed by a setlist-sequential compendium of videos from the night. We can’t wait for their return. Ireland’s Lisa Hannigan has recently been garnering more (deserved) notoriety, and as a result we have had the fortune to watch her performances (albeit from afar). Just last week we reported on her valiant video vignettes for L’Hiboo in Paris. Now we’ve unearthed some more of her fine performances in the Netherlands at the Motel Mozaique Festival, all of which refreshed our recollection of an NPR Tiny Desk Concert of hers from last year. First check her out performing I Don’t Know, Passenger and Venn Diagram at the Motel Mozaique Festival this past weekend, and then check out her Tiny Desk Concert at bottom. While we loved Frank Turner’s 2011 song I Am Disappeared and liked his album from that year. But the album wasn’t consistently good enough to make our Best Albums of 2011 list. So when he recently came through the Central Coast and we had a minor conflict, we skipped catching his shows. Turns out we might have blown it (again). There has been a deserved spate of videos put up recently of Turner performing Tom Petty’s all-time great song, American Girl. Check the best we found below, and next time he comes ’round join us and catch him live. In honor of the late, great Levon Helm, at Coachella last night The Black Keys and John Fogerty covered The Band’s The Weight (one of Levon’s signature vocalist efforts). We wish the off-key crowd would have been a bit more reverent (and quiet), but still Dan Auerbach and John Fogerty shine through.